Lenin Moreno, Ecuador's president-elect, during a campaign event, Quito, Ecuador, March 30, 2017 (AP photo by Dolores Ochoa). On Sunday, April 2, Ecuadoreans returned to the polls to elect their president in a second round of voting after a highly contentious campaign season. 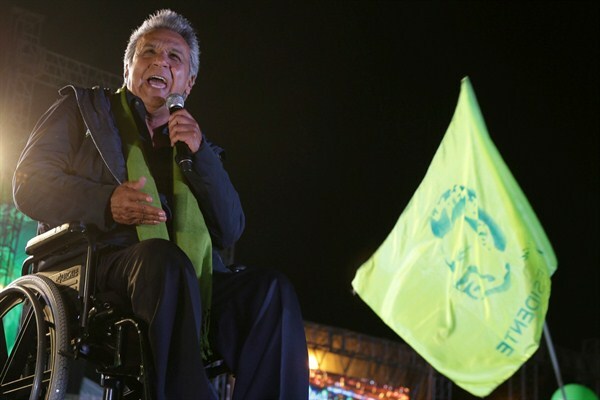 During the first-round ballot, former Vice President Lenin Moreno won 39.2 percent of the vote, just shy of the 40 percent required to avoid a runoff. His challenger in the second round was banker Guillermo Lasso, who won approximately 28 percent of the first-round vote.